Wild waterfowl provided an abundant source of food for settlers of the North Carolina coastal regions, and early residents often made decoys to lure the birds within range of their guns. Not until the late nineteenth century, however, did decoy making became a serious occupation, when market hunters and wealthy sportsmen exploited the huge flocks of migratory waterfowl wintering in the sounds and bays of North Carolina. During bad weather, fishermen and farmers produced thousands of gunning decoys for the hunting camps that sprang up from Currituck to Core Sound. The early artisans worked with little more than a hatchet and a knife, and visitors used to the delicate and decorative decoys common around the Chesapeake Bay sometimes greeted the rough-hewn products with derision. Most North Carolina carvers believed fooling the birds was all that mattered. Their decoys worked well and endured rough handling, while fragile beaks and necks could hardly survive such treatment. Carvers used any available wood along the North Carolina coast for decoys, usually indigenous and plentiful juniper, cedar, or pine. Any material found in the jetsam of the beaches was also used regularly. Carvers produced decoys of a large variety of ducks, geese, swans, and shorebirds, representative of their numbers in the wild or their popularity with hunters. Most were solid and carved from a single block of wood or cork, though some consisted of a wire frame fastened to a board and covered with canvas. Carvers made heads and necks separately and fastened them to the body with dowels or nails. Battered and damaged decoys were often repainted or had new heads attached to prolong use, so it is rare today to find a decoy with original paint or all parts made by a single carver. Hunting decoys were weighted, usually with lead, for adequate performance. Their paint was sometimes abraded to prevent reflectivity that could frighten birds away. Initials of the carver and sometimes the owner were branded or carved into the base. Restrictions on hunting gradually led to the decline of hunting camps and reduced demand for decoys. By 1950 few decoys were carved in North Carolina except for the personal use of residents. During the last half of the twentieth century, collectors sought out the remaining work of the early decoy makers, and connoisseurs of folk art acquired any they could find. Considered art objects, decoys were now found in living rooms and on fireplace mantels throughout the United States. The diminished availability of antique decoys led to the rebirth of decoy carving in North Carolina, as experienced carvers worked again and novices took up the craft to help meet the expanding market. Today, decoy collectors pay hundreds or thousands of dollars for an antique decoy in good condition reflecting the handiwork of a well-known carver. Even damaged antique decoys are in demand. Although some gunning decoys are still made and used, the trend is toward realism and decorative pieces. The band saw and the electric grinding tool have replaced original carving methods. Artists use wood burning tools to etch reproductions of individual feathers, and airbrushing and acrylic paint provide delicate work with elegant detail. Tupelo gum is the most popular wood for carvers today, though some still use juniper. Others make reproductions of the old Outer Banks-style decoys of canvas and wire. Antique decoys reside in museums and private collections, and a large number of modern decorative decoys are available in craft shops and shows. Decoys reflect a tradition that has achieved new recognition in the state and enjoys an increasing number of advocates as an art form. William Neal Conoley Jr., Waterfowl Heritage: North Carolina Decoys and Gunning Lore (1982). Henry A. Fleckenstein Jr., Southern Decoys of Virginia and the Carolinas (1983). 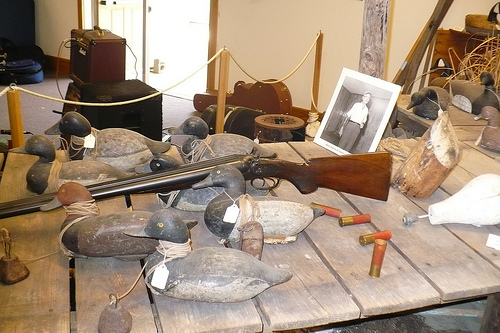 Archie Johnson and Bud Coppedge, Gun Clubs and Decoys of Back Bay and Currituck Sound (1991). "Handmade duck decoys", Core Sound Waterfowl Museum & Heritage Center. Image courtesy of Flickr user denseatoms. Available from http://www.flickr.com/photos/denseatoms/3560782031/ (accessed June 15, 2012).